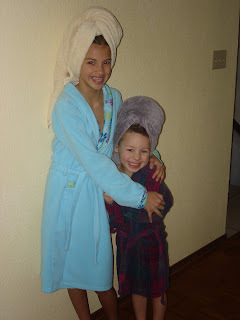 Ashley has always been the most patient big sister with Alex. At times, I wonder if it's more than he deserves (the little toot!). They slept together just about every night, up until just recently, and still do at times, they still bathe together at times, and she's even allowed him to spend the night with her at a friends house on more than one occassion. She has been and still is, to me, a perfect example of what a big sister should be. Lately though, Ashley has been going through what we knew someday she would. Adolescence. Now, so far this has been nothing but a positive experience for all of us, different, but positive. She has done an amazing job of communicating her needs, which is essential in getting through this time. She's becoming less and less dependant upon me, and more and more she's becoming her own person. This is good. This brings me to my proud moment. My son. He can be a major high maintainence pain in the patootie at times, ESPECIALLY to his ever so patient big sister. Lastnight, Ashley communicated to us that she needs some privacy from him. We sat down and had a talk, Ashley, Alex and I (and daddy listening in from the kitchen). Ashley established her needs and we set some new ground rules for Alex, which are ultimately just common courtesies that Alex has somehow managed to dodge with miss patience. I was so proud of her for expressing her needs in a way that Alex could understand, although in the back of my mind I was seriously doubting that he would follow through any time in the near future. He proved me wrong. Shortly after our conversation I hear little Alex knocking on Sissy's door and ASKING to come in. Write it down, mark the calendar, this has never, ever happened. Yay Alex. Today we had another bit of an awakening when Ash and Alex were both invited to spend the night with Kel. Alex loves to spend the night at Brian and Paula's, they adore him almost as much as we do and he is fully aware of that fact. Ashley expressed her need to have some "girl" time without Alex, and without missing a beat, he says "I really want to go Sissy, but if you want me to stay home, I don't mind." It is now several hours later and he has yet to retract that statement. Looks like we have more than just one kiddo growing up on us. Could our kids be any more amazing? That is the sweetest story. It sounds like they are going to be close even after they grow up, that is so special! I also LOVE your quote at the top of your blog. I could sure take a few pointers in communication from your kids. Well done, all! They make it sound so easy! Great PTT post. Thanks for joining us again!